Surrounded by southern Germany, Poland, Slovakia, and Austria, Czechia is located in the heart of Europe. Bohemia, a region divided into five sub regions in the west, makes up about half the country. 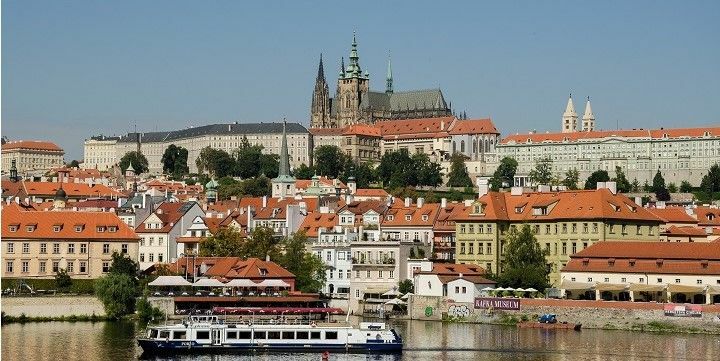 In addition to its well-known capital Prague, Bohemia has a lot to offer from historical forts and castles over picturesque towns to natural parks. Prague Castle is the world's largest ancient castle. Prague, also known as the “Golden City”, is home to many impressive historical buildings. The most famous one is for sure Prague Castle, the world’s largest ancient castle according to the Guinness Book of Records. Since the 14th century, Charles Bridge, which is lined with 30 giant stone sculptures, connects the Little Quarter with the Old Town. Here you’ll find many historical buildings such as the Estates Theatre, the gothic Church of Our Lady before Týn and the oldest operating astronomical clock at the outer wall of the Old Town Hall. Pilsen and Budweis, both close enough to Prague to be done in a day-trip, are mainly famous for their beer. A tour at the local Pilsen Urquell brewery or Budweiser Budvar brewery is a must-do, depending on which town you are visiting. In Pilsen, you’ll be able to continue your tour at the Brewery Museum, from where you can also access the city’s extensive underground tunnel network! 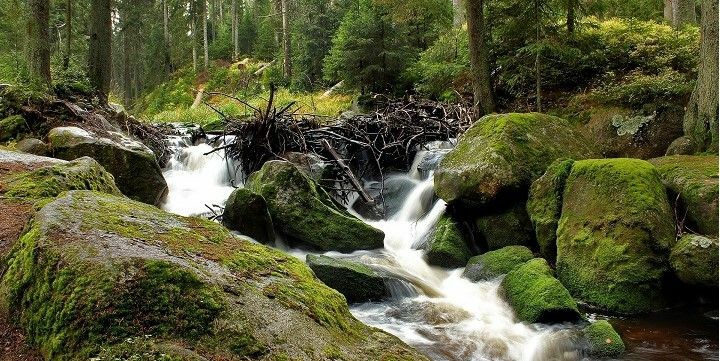 In the far West of Bohemia, at the Czech-German and the Czech-Austrian border, is the Bohemian Forest located. The mountain range has parts in all three countries including different names depending where you enter it from. Aside from a rich flora and fauna, the natural park is also home to unique upland moors and glacial lakes. The Bohemian Forest stretches over Czechia, Germany, and Austria. Other natural sites include the nature reserve Blanský Les with mountain Klet (1,083m) as well as Lake Lipno in South Bohemia. The latter is the largest lake of Czechia with visitors swimming, windsurfing, and sailing in summer as well as cross-country ski along the shore in winter. Right at the southern border of Blanský Les, Český Krumlov with cobblestone roads, colorful buildings, and some impressive Renaissance architecture, is located. Its Castle Český Krumlov was developed from a fort and is one of the must-sees in town. Another, less well-preserved fort — more a ruin — lies just about half an hour outside of Český Krumlov: Fort Dívčí Kámen was built in 1349, but has been abandoned since the early 16th century and slowly decayed since then. Hluboká Castle dates back to the 13th century. 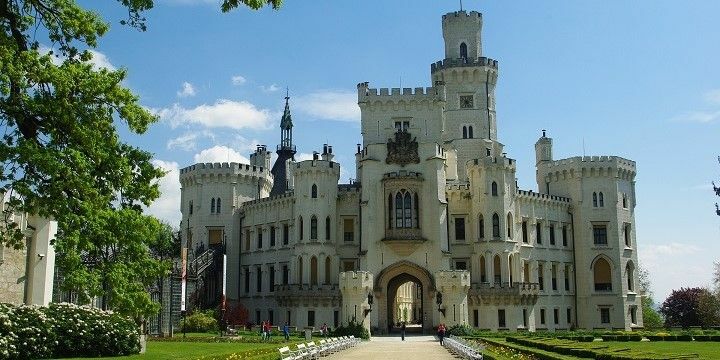 The same cannot be said about Hluboká Castle in the small village Hluboká nad Vltavou, one of the most significant Romantic monuments in Europe. Initially built in the 13th century in a Gothic style, it was rebuilt a couple times: Renaissance style in the 16th century, changing to Baroque style in the 18th century, and reaching the Romantic style in the latter half of the 19th century. Two towns with a very unique, yet very different story, shouldn’t be forgotten when speaking about Czechia: The small village of Holašovice, close to Budweis, was inhabited since the 13th century, but nearly erased in the 16th century by the plague with only two people surviving. Today, the original, restored houses with their impressive facades from about 800 years ago are still standing. While some of them cannot be entered, others are inhabited by the about 140 people living in the village. Kutná Hora is well-known for its Church of Bones. Kutná Hora, located an hour East from Prague, stands out for its Sedlec Ossuary, also known as the Church of Bones. 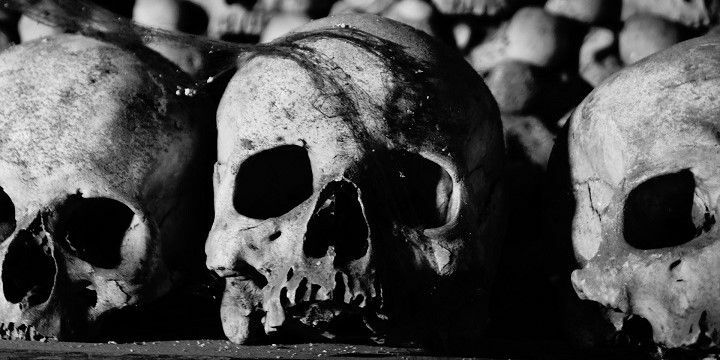 The church stores about 40,000 human skeletons, out of which about 10,000 were used to decorate the building from a bone chandelier to skull candle holders — a quite macabre art. If NextStop24 helped you to choose your next travel destination, we'd be very grateful if you’d search for your accommodation and things to do in Bohemia through these links. They're affiliate links, which means that we will receive a small commission for every booking made through them. There are no extra costs for you; you'll simply be helping to keep NextStop24 running. Thanks! I highly recommend staying in the lovely town of Cesky Krumlov and exploring the castles in the surrounding countryside. It's a hilly area with a lot of nice walks. The autumn colors were beautiful and there weren't many tourists at that time of year, which we liked. We also toured the Budweiser brewery in Budweis.